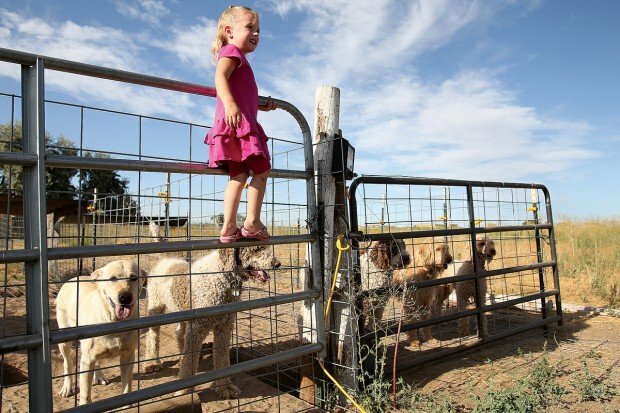 Adelynn Dixon, 3, looks at Labradoodles that her grandparents raise at their home near Jerome on Monday. Scott Dixon holds his granddaughter, Adelynn, as they walk to the kennel's used to raise labradoodle's at his home near Jerome on Monday. JEROME • Three-year-old Adelynn Dixon, smiling, led the way to the kennels several yards from the house. Adelynn knew the way well, because she plays with the dogs every day at her grandparents’ home in Jerome. There are benefits to that, said grandpa Scott Dixon. Interacting with the dogs is a good way to teach her respect for animals. It’s also a vital component in the dog-breeding process — the puppies get better socialized. 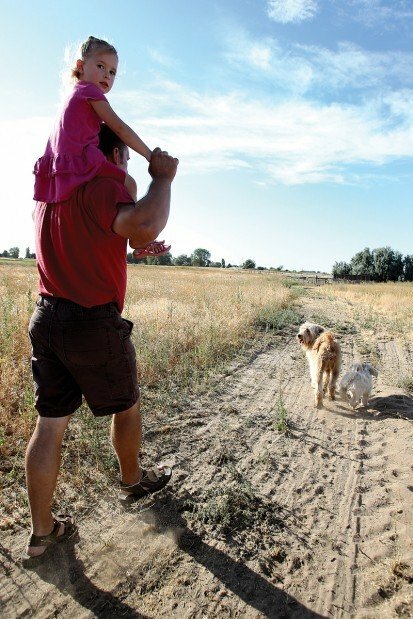 The Dixons, formerly of Twin Falls, moved last year to their home in rural Jerome, where they have more room for dogs. Scott built three long kennels that extend into large shed-like structures to protect dogs from the elements. “We call them doggie condos,” Margo said. They let the dogs out of the kennels often to play and run on the couple’s five-acre spread. But adequate space to sleep and recreate is only one thing the dogs require. And when puppies are born, the costs increase. The Dixons breed dogs at least twice a year and sell pups for between $500 and $600. But they invest a few hundred in the dogs before they’re sold, Scott said, including the costs to maintain the seven adults. Costs include shots, monthly vet checkups and food. The Dixons used to have their dogs professionally groomed, but that added to the expense. So they bought books and DVDs and learned to do it themselves, Margo said. The dogs need a lot of attention. Scott spends about six hours a day feeding, grooming, playing and training. When Steve and Anette McClain of Boise lost their golden retriever three years ago, they didn’t want another dog. “It was a hard time for our sons,” Anette said. Then in a Boise parking lot they met the Dixons and a litter of their Labradoodles, a dog the McClains didn’t know much about. “They were so adorable,” Anette said. But her family didn’t purchase a puppy right away. Instead, they went home to study up on the Dixons and learn more about Labradoodles. Once they decided to purchase a puppy, the McClains made a trip to the Dixons’ home to see the parent dogs. The McClains went home with a puppy and named him Cash. Labradoodles have the demeanor of Labs and the intelligence of poodles, one of the smartest dogs. For the first few years the Dixons bred dogs, they raised standard poodles. That changed when they met Espi, a now 6-year-old white Labradoodle that charmed the couple soon after they acquired the dog in 2005. Her favorite thing: hanging out with her family — whether it’s relaxing at home, running alongside during a jog or hanging out in the mountains on a camping trip. For breeding, the couple uses two standard poodle studs and four Labradoodle females or dams, making their litters F1b pups — or dogs that are 75 percent poodle, 25 percent Labrador. Their golden Lab is retired. Espi is pregnant with her last litter. The Dixons try to get three to five litters per dam before they retire her. “We’re not a puppy factory,” Scott said, noting if that were the case they’d be cranking out puppies a lot more than just two or three times a year. Whenever they retire an adult dog they try to find a good home for it. They’ve placed several dogs with people with disabilities. “A dog is always good therapy for them,” Scott said. Kimberly resident Cindy Newbry helps in that quest. The Dixons said it’s difficult to give up a dog once they’ve owned it for a while, and they don’t know if they’ll be able to give up Espi. As with any dog, there’s a lot of time and cost involved with breeding Labradoodles. • $50 a month per adult dog for food; about $20 per month per puppy from 4 weeks on. • $10 a month per dog on vet checkups. • $7 on shots per pup. View the dogs at dixonsarkranch.com.